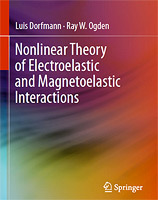 Dorfmann L and Ogden RW: Nonlinear Theory of Electroelastic and Magnetoelastic Interactions. New York: Springer, 2014. Dorfmann L, Paetsch C (2015) Modeling bioactive materials. In: Dorfmann L, Ogden RW (eds) Nonlinear mechanics of soft fibrous materials. CISM International Centre for Mechanical Sciences, Courses and Lectures Series 559, 175-232, Springer Wien, New York. Dorfmann A, Ogden RW Nonlinear electro- and magneto-elastic interactions. In (2012) Merodio J and Saccomandi G (eds) Continuum Mechanics, Encyclopedia of Physical Sciences, Engineering and Technology Resources, 41-111. Encyclopedia of Life Support Systems (EOLSS), UNESCO-EOLSS, EPLSS Publishers, Oxford, ISBN-978-1-84826-824-1. Dorfmann L (2010) Modeling nonlinear electroelastic materials. In: Ogden RW, Steigmann DJ (eds) Mechanics and electrodynamics of magneto- and electro-elastic materials. CISM International Centre for Mechanical Sciences, Courses and Lectures Series 527, 57-105, Springer Wien, New York. Dorfmann L (2009) Modeling of Rubberlike Materials. In: Klepaczko JR, Lodygowski T (eds) Advances in constitutive relations applied in computer codes. CISM International Centre for Mechanical Sciences, Courses and Lectures Series 515, 147-202, Springer Wien, New York. Lin WJ, Iafrati MD, Peattie RA, Dorfmann L (2019) Non-axisymmetric dilatation of a thick-walled aortic aneurysmal tissue. Int J Nonlinear Mech 109:172-181. Ahamed T, Peattie RA, Dorfmann L, Cherry Kemmerling EM (2018) Pulsatile flow measurements and wall stress modeling in a patient specific abdominal aortic aneurysm. ZAMM - Z Angew Math Me 98:2258-2274. Dorfmann L, Ogden RW (2018) The effect of deformation dependent permittivity on the elastic response of a finitely deformed dielectric tube. Mech Res Commun 93:47-57. Dorfmann L, Saccomandi G, Salvatori MC (2018) On the use of universal relations in modeling nonlinear electro-elastic materials. Int J Mech Sci 149:577-582. Fu Y, Xie Y-X,Dorfmann L (2018) A reduced model for electrodes-coated dielectric plates. Int J Nonlinear Mech 106:60-69. Fu Y, Dorfmann L, Xie Y (2018) Localized necking of a dielectric membrane. Extreme Mechanics Letters 21:44-48. Lin WJ, Iafrati MD, Peattie RA, Dorfmann L (2018) Growth and remodeling with application to AAA. J Eng Math 109:113-137. Nudel I, Dorfmann L, deBotton G (2017) The compartment syndrome: is the intra-compartment pressure a reliable for early diagnosis? Math Med Biol 34:547-558. Dorfmann L, Ogden RW (2017) Nonlinear electroelasticity: materials, continuum theory and applications. Proc R Soc A 473:20170311. Pancheri FQ, Peattie RA, Reddy ND, Ahamed T, Lin W, Ouellette TD, Iafrati MD, Dorfmann L (2017) Histology and biaxial mechanical behavior of abdominal aortic aneurysm tissue samples. J Biomech Eng 139, 031002. Peattie RA, Golden E, Nomoto RS, Margossian CM, Pancheri FQ, Edgar ES, Iafrati MD, Dorfmann L (2016) A technique for comparing wall pressure distributions in steady flow through rigid versus flexible patient-based abdominal aortic aneurysm phantoms. Exp Techniques 40:1187-1201. Moulton DE, Lessinnes T, O'Keeffe S, Dorfmann L, Goriely A (2016) The elastic secrets of the chameleon tongue. Proc R Soc A 472:20160030. Ahamed T, Dorfmann L, Ogden RW (2016) Modelling of residually stressed materials with application to AAA. J Mech Behav Biomed Mater 61:221-234. Ahamed T, Rubin MB, Trimmer BA, Dorfmann L (2016) The time-dependent behavior of passive skeletal muscle. Continuum Mech Therm 28:561-577. Paetsch C, Dorfmann L (2015) Stability of active muscle tissue. J Eng Math 95:193-216. Dorfmann L, Ogden RW (2015) Corrigendum to: Instabilities of an electroelastic plate. Int J Eng Sci 92:95-96. Pancheri FQ, Eng CM, Lieberman DE, Biewener AA, Dorfmann L (2015) Corrigendum to: A constitutive description of the anisotropic response of the fascia lata. J Mech Behav Biomed 30:306-323. Pechenik JA, Diederich CM, Burns R, Pancheri FQ, Dorfmann L (2015) Influence of the commensal gastropod Crepidula plana on shell choice by the marine hermit crab Pagurus longicarpus, with an assessment of the degree of stress caused by different eviction techniques. J Exp Mar Biol Ecol 469:18-26. Kaklamanos J, Dorfmann L, Baise LG (2015) A Simple approach to multidimensional earthquake site response. Seismol Res Lett 86:413-423. Kaklamanos J, Baise LG, Thompson EM, Dorfmann L (2015) Comparison of 1D linear, equivalent-linear, and nonlinear site response models at six KiK-net validation sites. Soil Dyn Earthq Eng 69:207-219. Dorfmann L, Ogden RW (2014) Nonlinear response of an electroelastic shell. Int J Eng Sci 85:163-174. Adler JH, Dorfmann L, Han D, MacLachlan S, Peatsch C (2014) Mathematical and computational models of incompressible materials subject to shear. IMA J Appl Math 79:889-914. Pancheri FQ, Dorfmann L Strain controlled biaxial stretch (2014) An experimental characterization of natural rubber. Rubber Chem Technol 87:120-138. Eng CM, Pancheri FQ, Lieberman DE, Biewener AA, Dorfmann L (2014) Directional differences in the biaxial material properties of fascia lata and the implications for fascia function. Ann Biomed Eng 42:1224-1237. Dorfmann L, Ogden RW (2014) Instabilities of an electroelastic plate. Int J Eng Sci 77:79-101. Pancheri FQ, Eng CM, Lieberman DE, Biewener AA, Dorfmann L (2014) A constitutive description of the anisotropic response of the fascia lata. J Mech Behav Biomed 30:306-323. Paetsch C, Dorfmann A (2013) Non-linear modeling of active biohybrid materials. Int J Nonlinear Mech 56:105-114.
deBotton G, Bustamante R, Dorfmann A (2013) Axisymmetric bifurcations of thick spherical shells under inflation and compression. Int J Solids Struct 50:403-413. Dorfmann A, Pancheri FQ (2012) A constitutive model for the Mullins effect with changes in material symmetry. Int J Nonlinear Mech 47:874-887. Paetsch C, Trimmer BA, Dorfmann A (2012) A constitutive model for active-passive transition of muscle fibers. Int J Nonlinear Mech 47:377-387. Kluge JA, Leisk G, Cardwell RS, Fernandes AP, House, M., Ward A, Dorfmann AL, Kaplan DL (2011) Bioreactor system for biomaterial design studies utilizing real-time mechanical loading control and noninvasive imaging. Ann Biomed Eng 39:1390-1402. Lin HT, Paetsch CR, Slate D, Dorfmann L, Trimmer BA (2011) Ontogenetic scaling of caterpillar body properties and its biomechanical implications on the use of hydrostatic skeleton, J Exp Biol 214:1194-1204. Bustamante R, Dorfmann A, Ogden RW (2011) Numerical solution of finite geometry boundary-value problems in nonlinear magnetoelasticity. Int J Solids Struct 48:874-883. Kluge JA, Thurber A, Leisk G, Kaplan DL, Dorfmann A (2010) A model for the stretch-mediated enzymatic degradation of silk fibers. J Mech Behav Biomed 3:538-547. Dorfmann A, Ogden RW (2010) Electroelastic waves in a finitely deformed electroactive material. IMA J Appl Math 75:603-636. Dorfmann A, Ogden RW (2010) Nonlinear Electroelasticity: Incremental Equations and Stability. Int J Eng Sci 48:1-14. Dorfmann A, Wilson C, Edgar ES, Peattie RA (2010) Evaluating Patient-Specific Abdominal Aortic Aneurysm Wall Stress Based on Flow-Induced Loading. Biomech Model Mechan 9:127-139. Dorfmann A, Merodio J Ogden RW (2010) Non-smooth solutions in the azimuthal shear of an anisotropic nonlinearly elastic material. J Eng Math 68:27-36. Kluge JA, Rosiello NA, Leisk G, Kaplan DL, Dorfmann A (2010) The Consolidation Behavior of Silk Hydrogels. J Mech Behav Biomed 3:278-289. Bose K., Dorfmann A (2009) Computational Aspects of a Pseudo-Elastic Constitutive Model for Muscle Properties in a Soft-Bodied Arthropod. Int J Nonlinear Mech 44:42-50. Shmoylova E., Dorfmann A (2009) Wrinkling of a Fiber-Reinforced Membrane. J Appl Mech-T ASME 76, Paper number 011011-1. Bustamante R, Dorfmann A, Ogden RW (2009) Nonlinear Electroelastostatics: A Variational Framework. Z Angew Math Phys 60:154-177. Lin HT, Dorfmann A, Trimmer BA (2009) Soft Cuticle Biomechanics: A Constitutive Model of Anisotropy for Caterpillar Integument. J Theor Biol 256:447-457. Bustamante R, Dorfmann A, Ogden RW (2009) On Electric Body Forces and Maxwell Stresses in nonlinearly Electroelastic Solids. Int J Eng Sci 47:1131-1141. Dorfmann A, Trimmer BA, Woods W.A (2008) Muscle Performance in a Soft-Bodied Terrestrial Crawler: Constitutive Modeling of Strain-Rate Dependency. J Roy Soc Interface 5:349-362. Soffer L, Wang X, Zhang X, Kluge J Dorfmann L, Kaplan D, Leisk G (2008) Silk-based electrospun tubular scaffolds for tissue-engineered vascular grafts. Journal of Biomaterials Science 19:653-664. Shmoylova E., Dorfmann A (2008) Wrinkling of anisotropic soft membranes. Mech Res Commun 35:246-255. Shmoylova E., Dorfmann A, Potapenko S (2008) Weak solutions of the electrostatic force in atomic force microscopy. Z Angew Math Phys, 59:702-714. Bustamante R, Dorfmann A, Ogden RW (2008) On Variational Formulations in Nonlinear Magnetoelastostatics. Math Mech Solids 13:725-745. Shmoylova E., Potapenko S, Dorfmann A (2007) Weak Solutions to Anti-Plane Boundary Value Problems in a Linear Theory of Elasticity with Microstructure. Archives of Mechanics 59:519-539. Bustamante R, Dorfmann A, Ogden RW (2007) A Nonlinear Magnetoelastic Tube under Extension and Inflation in an Axial Magnetic Field: Numerical Solution. J Eng Math 59:139-153. Dorfmann A, Ogden RW, Wineman A.S (2007) Flow of Magnetorheological Fluids. Int J Nonlinear Mech 42:381-390. Dorfmann A, Trimmer BA, Woods W.A (2007) A Constitutive Model for Muscle Properties in a Soft Bodied Arthropod. J Roy Soc Interface 4:257-269. Dorfmann A, Haughton DM (2006) Stability and Bifurcation of Compressed Elastic Cylindrical Tubes. Int J Eng Sci 44:1353-1365. Bustamante R, Dorfmann A, Ogden RW (2006) Universal Relations in Isotropic Nonlinear Magnetoelasticity. The Q J Mech Appl Math 59:435-450. Dorfmann A, Ogden RW (2006) Nonlinear Electroelastic Deformations. J Elast 82:99-127. Dorfmann A, Ogden RW (2005) Some Problems in Nonlinear Magnetoelasticity. Z Angew Math Phys 56:718-745. Dorfmann A, Ogden RW (2005) Nonlinear Electroelasticity. Acta Mech 174 (2005). 167-183. Brigadnov IA, Dorfmann A (2005) Mathematical Modelling of Magnetorheological Fluids. Continuum Mech Therm 17:29-42. Dorfmann A, Ogden RW, Saccomandi G (2005) The Effect of Rotation on the Nonlinear Magnetoelastic Response of a Circular Cylindrical Tube. Int J Solids Struct 42:3700-3715. Dorfmann A (2004) The Pseudo-Elastic Response of Rubberlike Solids. PAMM, Proceedings in Applied Mathematics and Mechanics 4:390-391. Dorfmann A, Ogden RW (2004) Nonlinear Magnetoelastic Deformations. The Q J Mech Appl Math 57:599-622. Burtscher S, Dorfmann A (2004) Compression and Shear Tests of Anisotropic High Damping Rubber Bearings. Eng Struct 26:1979-1991. Nussbaumer G, Dorfmann A (2004) FE-Berechnungsmethoden von zylindrischen Tankbauwerken unter Erdbebenbelastung, (in German). Bauingenieur 11:506-515. Dorfmann A, Ogden RW, Saccomandi G (2004) Universal Relations for Magnetoelastic Solids. Int J Nonlinear Mech 39:1699-1708. Drozdov AD, Dorfmann A (2004) A Constitutive Model in Finite Viscoelasticity of Particle-Reinforced Rubbers. Meccanica 39:245-270. Dorfmann A, Ogden RW (2004) A Constitutive Model for the Mullins Effect with Permanent Set in Particle-Reinforced Rubber. Int J Solids Struct 41:1855-1878. Dorfmann A, Ogden RW (2004) Nonlinear Magnetoelastic Deformations of Elastomer. Acta Mech 167:13-28. Dorfmann A, Brigadnov I.A (2004) Constitutive Modelling of Magneto-Sensitive Cauchy-Elastic Solids. Comp Mater Sci 29:270-282. Dorfmann A (2003) Stress Softening of Elastomers in Hydrostatic Tension. Acta Mech 165:117-137. Dorfmann A, Ogden RW (2003) Magnetoelastic Modelling of Elastomers. European Journal of Mechanics - A/Solids 22:497-507. Brigadnov I.A, Dorfmann A (2003) Mathematical Modelling of Magneto-Sensitive Elastomers. Int J Solids Struct 40:4659-4674. Drozdov AD, Dorfmann A (2003) Finite Viscoelasticity of Filled Rubbers: Experiments and Numerical Simulation. Archives of Applied Mechanics 72:651-672. Drozdov AD, Dorfmann A (2003) A Micromechanical Model for the Response of Filled Elastomers at Finite Strains. Int J Plasticity 19:1037-1067. Dorfmann A, Ogden RW (2003) A Pseudo-Elastic Model for Loading, Partial Unloading and Reloading of Particle-Reinforced Rubber. Int J Solids Struct 40:2699-2714. Drozdov AD, Dorfmann A (2003) Physical Aging and the Viscoelastic Response of Glassy Polymers: Comparison of Observations in Mechanical and Dilatometric Tests. Math Comput Model 37:665-681, 2003. Drozdov AD, Dorfmann A (2002) Finite Viscoelasticity of Filled Rubbers: The Effect of Pre-Loading and Thermal Recovery. Continuum Mech Therm 14:337-361. Drozdov AD, Dorfmann A (2002) The Nonlinear Viscoelastic Response of Carbon-Black Filled Rubbers. Int J Solids Struct 39:5699-5717. Drozdov AD, Dorfmann A (2002) The Influence of Pre-Loading and Thermal Recovery on the Viscoelastic Response of Filled Elastomers. Mech Res Commun 29:247-256. Dorfmann A, Fuller KNG, Ogden RW (2002) Shear, Compressive and Dilatational Response in Rubberlike Solids subjected to Cavitation Damage. Int J Solids Struct 39:1845-1861. Drozdov AD, Dorfmann A (2002) Finite Viscoelasticity of Particle-Reinforced Elastomers: The Effect of Filler Content. Macromelecular Theory and Simulations 11:383-400. Drozdov AD, Dorfmann A (2002) The Payne Effect for Particle-Reinforced Elastomers. Polym Eng Sci 42:591-604. Drozdov AD, Dorfmann A (2002) The Effect of Temperature on the Viscoelastic Response of Rubbery Polymers at Finite Strains. Acta Mech 154:189-214. Drozdov AD, Dorfmann A (2002) Modeling the Response of Filled Elastomers at Finite Strains using the Concept of Rigid-Rod Networks. Archive of Applied Mechanics 72:52-76. Dorfmann A, Burtscher S (2001) Experimental and Numerical Aspects of Cavitation. Int J Polym Mater 5:235-241. Drozdov AD, Dorfmann A (2001) The Effect of Annealing Temperature on the Viscoelastic Response of Glassy Polymers. Mech Res Commun 28:355-362. Drozdov AD, Dorfmann A (2001) The Stress-Strain Response and Ultimate Strength of Filled Elastomers. Comp Mater Sci 21:395-417. Drozdov AD, Dorfmann A (2001) Stress-strain Relations in Finite Viscoelastoplasticity of Rigid-Rod Networks: Applications to the Mullins Effect. Continuum Mech Therm 13:183-205. Dorfmann A, Burtscher S (2000) Aspects of Cavitation Damage in Seismic Bearings, ASCE. Journal of Structural Engineering 126:573-579. Dorfmann A, Burtscher S (2000) Experimental and Computational Aspects of Cavitation in Natural Rubber. International Journal of Plastics, Rubber and Composites 29:80-87.